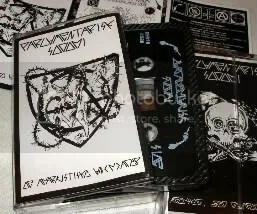 Parlamentarisk Sodomi’s second album has been re-released on cassette. Here you have anti-hits like “Jevn Oslo Med Jorda” and the 10 minute grindcore opus “Klæbukrønikene”. It also includes all six songs from the first PS 7″ EP as bonus tracks. Please email your order with your address to parlamentarisk [at] hotmail [dot] com. This entry was posted in Uncategorized and tagged cassette, Parlamentarisk Sodomi. Bookmark the permalink. this is another review from the same guys reviewing the PSUDOKU tape. He begnis with a lie, saying four years ago THIS PRESIDENT took…. OOOPS… try again… Four years ago this CONGRESS…. Yes, that’s the truth, they voted for the Iraq war. I am sick of white-flag-waving retreat-in-defeat elected officials blaming President Bush for their vote!